The refrigeration compressor shown in the top figure is mounted to automobile engines without any vibration decoupling. On a motor test bench the operating vibrations were measured at the location of the compressor. Additional enhancement factors due to the number of probes, testing time and nonlinearities were considered in order to obtain excitation spectra for qualifying vibration tests on a shaker. The maximum foot point excitation amounts approx. 40 [g]. Frequencies up to 2 [kHz] appear to be relevant for the durability of the compressor. For mounting the compressor on the shaker, a suitable bracket is required. The bracket must be sufficiently stiff, so that the shaker translations are transferred to the mounting positions of the compressor without the influence of resonances up to 2 [kHz]. The mass of the bracket may not exceed a fixed limit. Otherwise the force of the shaker would not be sufficient to achieve the projected maximum acceleration. Additionally, the installation space is limited. 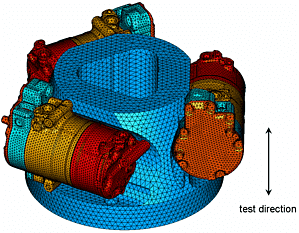 Furthermore, in order to minimize test times, it is favorable to test several compressors simultaneously. The FE analysis accompanying the design process showed that within the given restraints it is not possible to raise all natural frequencies of the test setup beyond 2 [kHz]. Especially the lowest torsional mode of the bracket about the shaker axis and the lowest bending/tilting modes are located below 2 [kHz]. 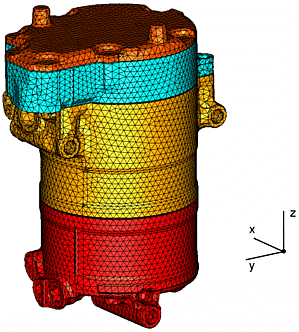 However, by a symmetric design of the bracket and a symmetric loading with compressors it can be achieved that these vibration modes are excited only very weakly and won’t influence the test results. 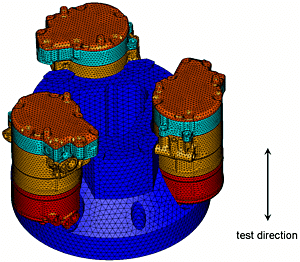 The mid and the bottom figure show the developed mounting brackets for two different test directions for testing three compressors simultaneously.